As the indoor season comes to an end, I’d like to explain some basic elements of what I think makes a good photo of fast moving athletes, especially in low light situations. The basic problem: Imagine there is low light and you shoot in the full auto mode. The camera will (among others) reduce the shutter speed. So you end up with a blurred picture because of the fast movement. In my beginnings the following picture would have been one of my better result. Needless to say, this picture is crap. A crap picture with motion blur. 1/160 sec, 1000 ISO, f3.2, 14mm, Canon EOS 5D3. Theoretically, you can turn the above picture into a sharp one as follows: Increase the shutter speed to 1/1250 sec (this is 1/8 of the previous exposure time). To compensate choose an 8-times higher ISO value, 8’000. If your camera tolerates ISO 8’000 you will get a nice and sharp picture. There are great cameras on the market that tolerate ISO 8’000. They are expensive, though. The usual next step is to use a flash. How does this work? Make sure you underexpose a little, then let the flash pop in with the right amount to freeze the scenery. If you don’t underexpose, you end up with a strange mix of blurred and frozen movement. Some people like this. I find it just awkward. First, they are forbidden at many events, for good reasons. Second, if some athletes are close and some far away, the close ones might be overexposed and the far away ones underexposed (see this picture). This looks very un-natural. Third, the flash freezes the motion. Hence when shooting cars, or cyclists from the side, the wheels seemingly stand still. Here is an example. Isn’t it strange that the riders are in a 45 degree steep curve and manage to balance their bike on one spot? To be clear. I’m not saying flashes are always bad. 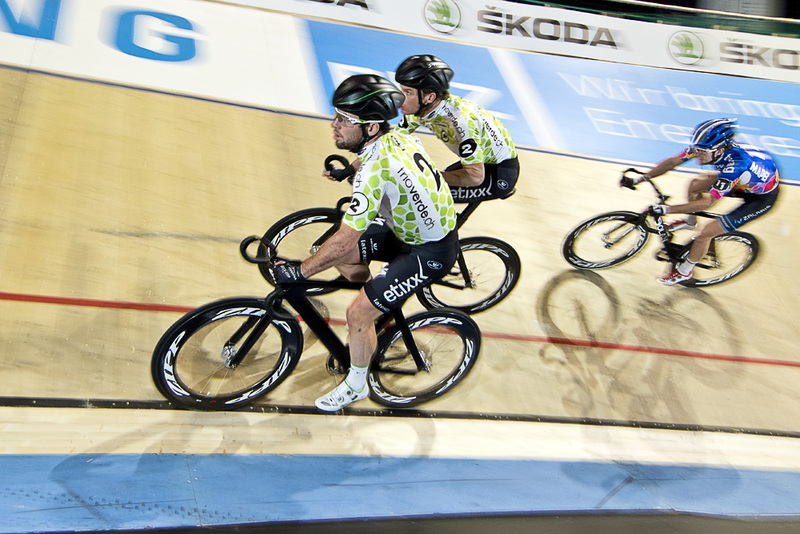 They saved my neck in many situations (I shot the above picture because I had to get a sharp picture of superstar Mark Cavendish. No time for experiments). Photography masters produce terrific results with flashes. For instance, look at this picture by one of my idols, Kristof Ramon. It’s just that frozen pictures from the side are not good in most situations. What is the solution? Panning. Don’t regard the low light as your enemy. Make it your friend. Panning solves more than one problem in sports photography. 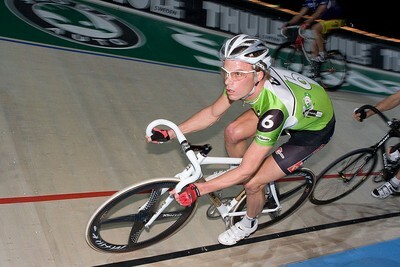 The following picture of Jens Voigt is a nice example. The difference to the previous picture of Mark Cavendish is obvious. 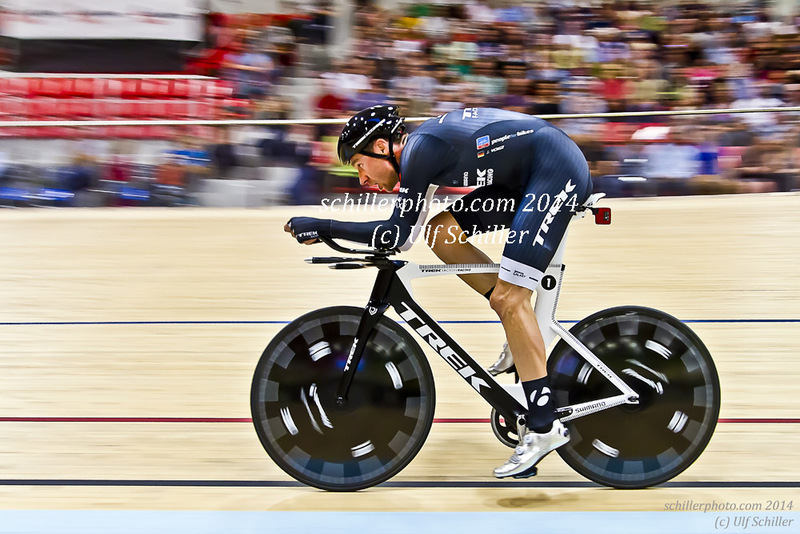 Jens’ picture expresses speed, Mark’s picture does not. Both have blurred background, but look twice. The blur in Mark’s picture is unnatural due to the flash. The blur in Jens’ picture is nice, even, and natural. So how did I do this? I set the shutter speed to 1/160. This is eight times less than it needs to freeze the motion (some say you should take 1/30, but in most cases this is not necessary). To get a sharp picture, I chose a single autofocus point, concentrated on Jens’ face and moved the camera exactly with Jens’ speed. As a result, the face is sharp, the rest is blurred. The advantages are clear. The background is blurred, Jens is in focus. Moreover, the picture expresses the speed – it is exciting. 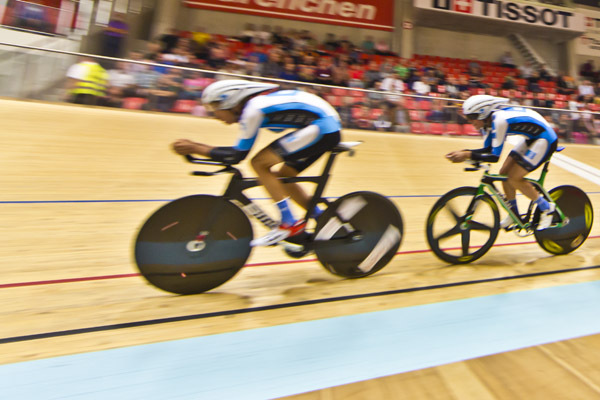 So exciting that a super-sized copy is hanging on the wall of the Swiss Velodrome. So what are the drawbacks? To be honest, panning isn’t easy. There is always a risk that you fail. Here are my tips. 1. Concentrate a lot. Any distraction will cause a blurred shot. If the eye is blurred, delete the picture. 2. Choose the ideal distance (if possible). 20-30 meters and a light tele lens are much easier than the 3.5 meters with Jens’ picture. Here is an example from athletics taken with 25 meters distance and 135mm. I took pictures of every heat. Each(!) attempt was successful. 3. If you are forced to shoot from a closer distance, anticipate the changing angular velocity of your subject. It is fastest just when it passes your position. If you don’t anticipate the effect, your panning will be too slow. 4. Train this. Your success rate will increase a lot. I have a friend who shoots professional pictures for the automotive industry. Guess what? He trains panning regularly. 5. Choose a rich background. A blue sky or a concrete wall would hide the effect. So you have no benefit but the risk of blurring the image. Conclusion. Some people that see my pictures respond with “you have a good camera“. Yes I do. This blog is not about a camera. It is about a shooting technique that I even applied successfully with quite cheap cameras.